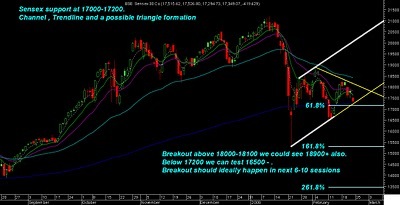 Sensex seems to be in a triangle and the levels to watch are 17000-17200 on lower side as there is also a gap around 17140-17265 which can get filled or support also. On the upside 18000-18100 seems to be the near term resistance . 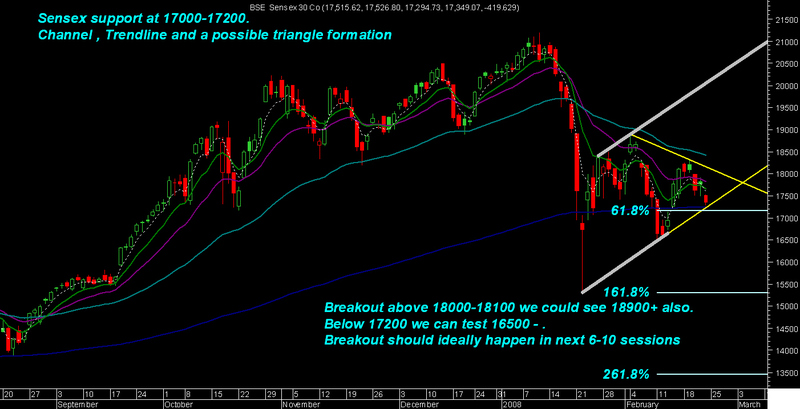 A breakout below the triangle could see testing of 16500 or lil below that again. On the upside move can give a move beyond 18900 zones . The Strategy would be to wait and watch for a clear move which should come any time in next 2 weeks. The budget seems the next trigger but all the world indices seem to be in triangle formations so a pre budget rally would ideally need good back up support from the world 🙂 too . Investors can wait with cash as they can get an opportunity to buy at good value levels on breakdown and if there is breakout on upside then buying a little higher would be much more comfortable as returns could be quicker and better. So dont be in a hurry but be ready to spot the opportunities. Fertlizer stocks like nagarjuna , chamble have sustained well and can run on back of budget sops. Buy above 56 and 65 for quick moves. Ranbaxy is nearing 420-425 resistance zone and close above 435 is a level to watchout. 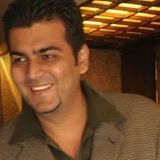 Till then keep it on watchlist if it tries to give a good move.